Experience Jigsaw's traps first hand in this live action horror maze. Following the success of Saw the Ride, Thorpe Park launched Saw Alive for the 2010 as a year round live action scare maze attraction featuring iconic moments from the Saw movies. Guests come face to face with Billy the puppet under the control of sadistic Jigsaw, and experience six terrifying scenes including the famous bathroom, freezer and shotgun traps. The maze is located onboard the Thorpe Belle, a steamboat which formerly hosted the park's education centre. Fans of the Saw movies will easily recognise the well themed scenes contained within, and it is easy to feel unnerved by the genuinely scary actors located throughout. If there's a minor negative, it's in the overall concept: the genuine fear within the Saw movies is of the people caught in Jigsaw's traps, but in Saw Alive guests (understandably!) only get to experience these torture devices as passive observers. That doesn't, however, prevent the heart from racing as you come face to face with Jigsaw hidden behind his famous pig mask. 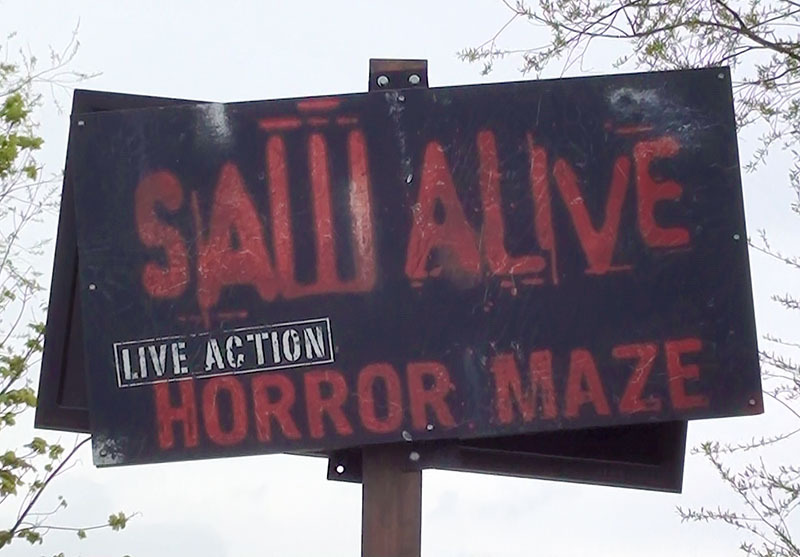 Although originally conceived as a year round attraction, Saw Alive was closed at the beginning of the 2012 season following the successful opening of The Swarm, and since then has only been open seasonally during the annual Fright Nights Halloween event.